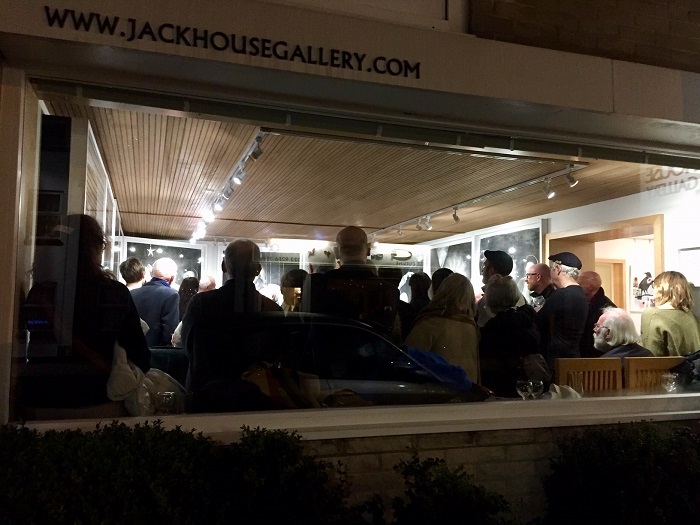 When Jack House Gallery opened in April 2015 with a show of large drawings by young British Ghanaian artist Amartey Golding it was always our intention to invite people into the space to talk to the artists and discuss the art. The life of a gallery and the artists it shows thrives on feedback and debate and Amartey is an artist who asks for that dialogue and deliberately makes work that provokes it. During the show we invited a local school of teenagers into the space to meet the artist and discuss the more contentious aspects of the work and asking people to come to meet the artist and respond to the work has now become a regular part of the exhibitions we do. We expect it of our artists. We now regularly work with Golding showing his first film ‘Chainmail’ in Autumn 2016 projecting the short film onto the gallery wall and filling the space with local people we asked them to participate in a discussion about the film's themes around young black male stereotypes, attitudes to black male homosexuality (the film featured prominently Amartey’s brother Solomon who is gay and a classical dancer) and the artist’s own anecdotal experiences of the tragic loss of young black lives to knife crime. 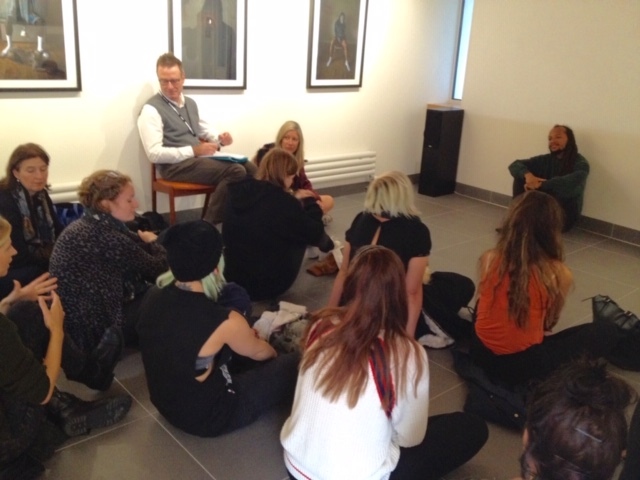 Groups of students were invited to subsequent screenings at the gallery followed again with discussions with the artist. We went on to submit Chainmail for a project space at Project Space at London Art Fair 2017 and the plaudits Amartey recieved led to 2 further films, again shown at the gallery with further audience discussions and a further solo show ‘Is it just me or is it you?’which went large scale to the Attenborough Centre, Leicester and there is a further Chainmail Project show at Jack House Gallery in the pipeline for later in 2019. Artist John Green is an ex-Dockyard worker with 45 years as a rigger in the Portsmouth Dockyard but not a day went by without a sketchbook in his pocket. With no formal training he drew constantly the men and ships around him compiling dozens of sketchbooks filled with images of his mates. Retiring in 1992 he became a full time artist taking a studio at Art Space Portsmouth and had his first show, ‘Dockies’ in 2016 at Jack House Gallery. It quickly became apparent that John’s work and the Portsmouth Dockyard meant an enormous amount to the people of the City. 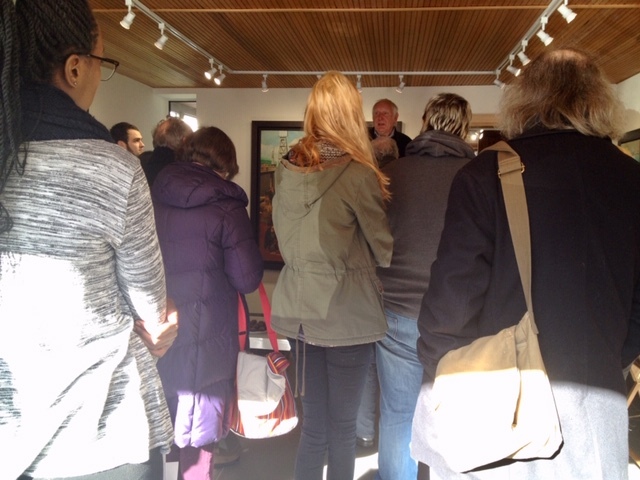 The gallery was visited by current ‘Dockies’, ex-Dockies of all trades, Dockies’ families and ordinary local people who remembered when the Dockyard was the biggest employer in the city and at the very heart of Portsmouth. The hundreds who visited the show either worked at the Dockyard or had a relative or knew someone who did and I was amazed to be told over and over again by these individuals that they had ‘never been into a gallery before’. We decided to bring contemporary Portsmouth together with it’s very recent past by inviting ex-Dockies to talk to Portsmouth University students and local people about their first hand experiences of starting as apprentice boys aged 15 going into the Dockyard effectively for life and what it meant to them and their forebears. At a further John Green show we held a Dockyard poetry evening during which a local poetry group, Tongues & Grooves, read poetry about the Dockyard by both local poets and Dockyard workers. 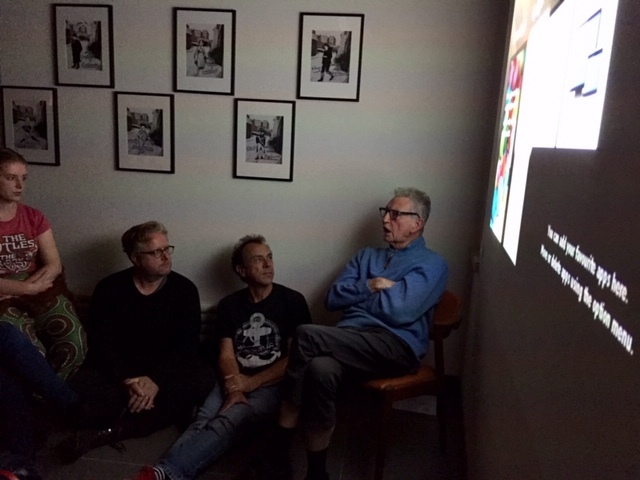 Other events at the gallery took place during the solo show for Portsmouth born artist Derek Boshier in September 2018 when we hosted a talk with Derek Boshier and Pop Art Historian Marco Livingstone when Boshier talked about his years at the Royal College, making the film ‘Pop Goes the Easel’, his friendship with artist Pauline Boty and his collaborations with Bowie & the Clash. The talk that played to a packed house and was filmed was then followed by an evening of film screenings of his short films, the earliest dating back to the 1970s. Boshier introduced each film and took questions afterwards from a large crowd of local people. Derek created a new series ‘Ghosts of Portsmouth’ specifically for his show and for the City of Portsmouth which is his home town. 2019 kicked off with a Q&A event which took place during Pete Codling’s show ‘Naivety’ when former Director of Aspex Gallery Les Buckingham went head to head with Codling to discuss the political elements of the work, Pete Codling’s upbringing as a Catholic and his views on the organised church, his working practice and his belief that art has a duty to communicate. We had our first foray into practical workshops during 2018 and now that we know it’s possible in the space with the right artist we are looking forward to planning further workshops in 2019/20. The first 2 were hosted by experienced artist tutor Jacqui Mair in conjunction with her solo show of new collages'Drawing with Scissors’. Jacqui took 2 mixed ability groups of 10 through the art of collage in intensive making sessions that resulted in some wonderful work and an enlightening discussion after about how individuals chose to approach Jacqui’s brief under her guidance. Having work created in the space surrounded by Jacqui’s own work was an incredibly positive experience made more so by what came after when young polish artist Agata Wojcieszkiewicz held her Still Life Study Workshops over a period of 6 days with again mixed ability people. Participants dipped in and out to spend 2 hours or 6 days sharing the experience of working from an intricate and stunning still life set-up which was themed to coincide with the anniversary of the Womens’ suffrage movement. This was an opportunity to network and socialise and for inexperienced people to work alongside experienced artists to share ideas, materials, techniques (and food) all guided by Agata in sessions that were contemplative, meditative and sometimes great fun with a great deal of work produced and an informal exhibition at the end with a group discussion about the work and what the workshops meant to the participants. Feedback from both artist led workshops was overwhelmingly in favour of more practical making in the gallery and many saying that it gave them a valuable insight into the individual artist’s processes. The workshop took place during Jacqui's show. Jacqui demonstrating techniques with gel plates. A compilation of some of the resulting work produced. We begged and borrowed for easels and drawing boards. A huge amount of work was produced and put on display at the end. We will continue to ask artists to contribute to shows in ways that will enlighten gallery visitors about their working processes and better understand what makes artists ‘tick’ as well as and to educate about for example print making techniques. Our printmaking group shows have featured fine art printmaker Kit Boyd illustrating his talk at the gallery with copper etching plates taking us through his proofing process when he showed as a member of the Greenwich Printmakers in 2015. Printmakers Sally Mackay, Christina France and Bethany Marett did the same in their subsequent show in 2017 when we invited visitors to the gallery to watch the demonstrations and ask questions which touched on both techniques and inspirations. The gallery has also hosted a reading of Under Milk Wood read by Artistic Director of the Groundlings Theatre when we showed the works of the same name by Sir Peter Blake in 2015. Gallery Director Rebecca Crow has regularly been asked to talk to groups of students from Portsmouth University about the exhibitions on show and welcomes approaches from schools and outside organisations to do the same. 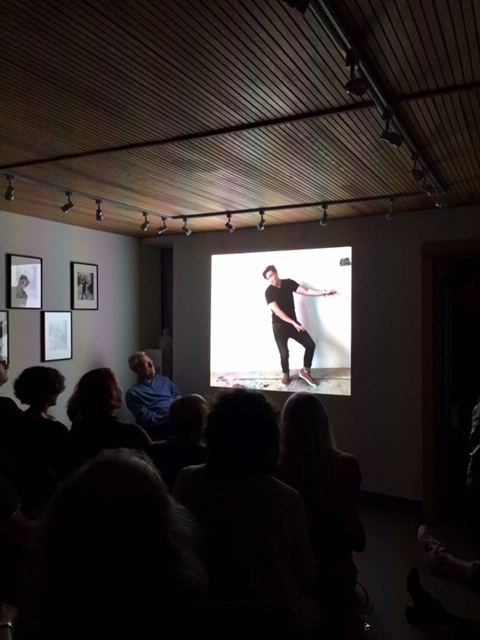 Highly well attended artist talks and Q&As have regularly been part of the gallery program and we endeavour to do these for FREE with an open door policy which has often resulted in huge crowds squeezing into the gallery. Watch this space for more in 2019/20 and let Rebecca know if you are a school or student group who would like to come along to the gallery or if you have an idea for a collaboration or event that you think would work at Jack House Gallery info@jackhousegallery.co.uk or 07503152848.